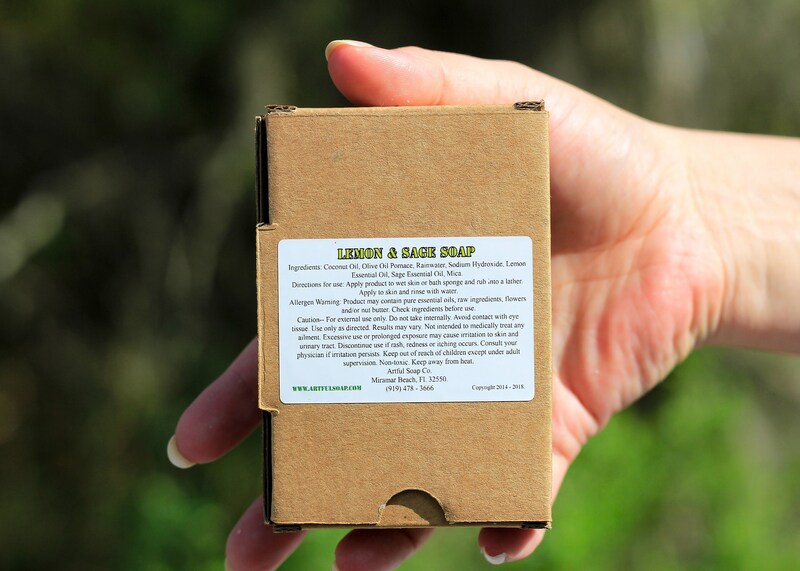 Lemon Sage Soap, Lemon and Sage, Natural Lemon Sage Soap, Lemon Oil, Sage Oil, Natural Soap, 100% Natural, Soap, Lemon, Sage. 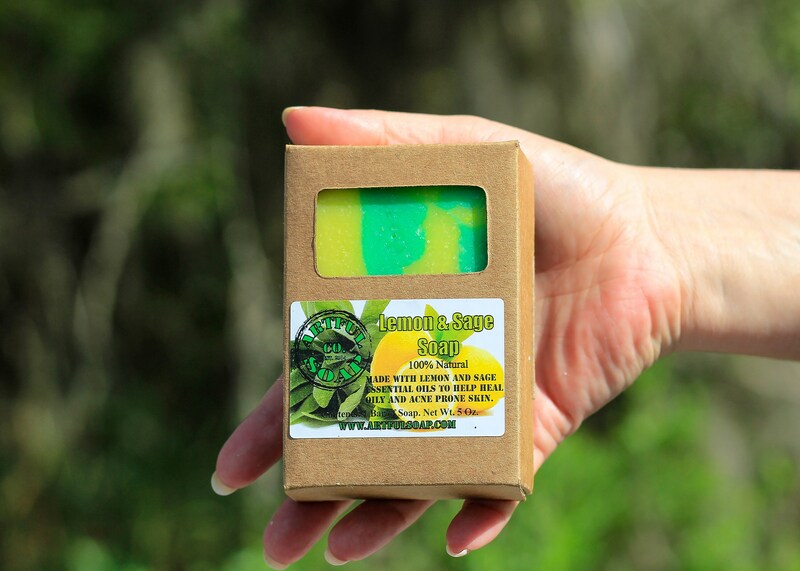 Rated as a customer favorite for it's amazing scent, our Lemon & Sage Soap combines pure lemon essential oil and sage essential oil for a fresh scent and amazing cleansing properties. 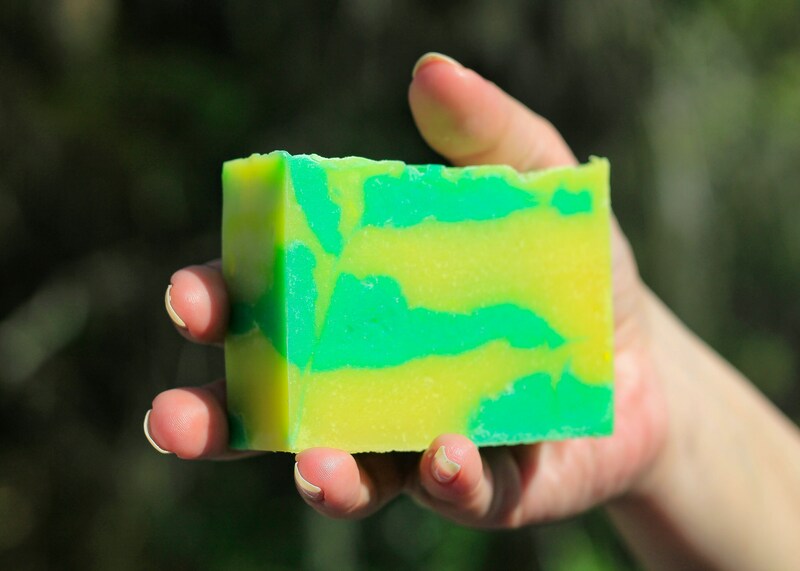 Naturally anti-microbial and deodorizing, this soap will become a family favorite for all members of the household! The color combination is bright and vibrant; sure to add a pop of color to any bathroom decor. Try a bar today and see for yourself why we have a hard time keeping this one in stock! Lemon oil is a good remedy for increasing the luster of dull skin. It is astringent and detoxifying in nature, and rejuvenates sagging or tired-looking skin. Its antiseptic properties help treat pimples and various skin disorders. It is also recommended for reducing excessive oil on the skin. Lemon oil is also effective as a hair tonic. Many people use lemon oil to get strong, healthy and shiny hair and helps to eliminate dandruff. The presence of camphor and camphene in this essential oil gives it an anti-fungal property. This oil is capable of inhibiting fungal infections externally, and gives relief from fungal infections like skin diseases, Athlete’s Foot, or dermatitis. This property is one of the causes behind its use in skin care products. The components in sage essential oil which give protection against fungal infections also provide protection against microbial infections too. Therefore, you can protect small wounds or cuts from developing irritating or potentially dangerous infections. This is perhaps the most valuable aspect of this essential oil and the reason behind its extensive use in anti-aging and skin treatment products. Antioxidants, as the name suggests, act against the oxidants or free radicals in the body, which are the main causes behind aging. These antioxidants slow down aging and prevent symptoms of aging like wrinkles, sagging skin and muscles, reduction in vision and hearing capabilities, malfunctioning of the brain, memory loss, degeneration of tissues, macular degeneration and nervous disorders. Since it has antimicrobial, antibacterial and anti-fungal properties, it serves as an antiseptic for wounds, ulcers, and sores. It reduces inflammations on the skin. This is yet another property which has made a strong place in the world of cosmetics as a key ingredient of anti-mark and anti-spot cream. This property helps eliminate scars, post-natal abdominal marks and after-spots left by boils, pox, and sores. This also helps in quick healing of wounds and incisions. NOTE: Being a nervous stimulant, those with epilepsy, hysteria, or a history of either, should avoid using it. Furthermore, since it contains camphor and camphene, which are toxic in nature, it should be avoided during pregnancy. 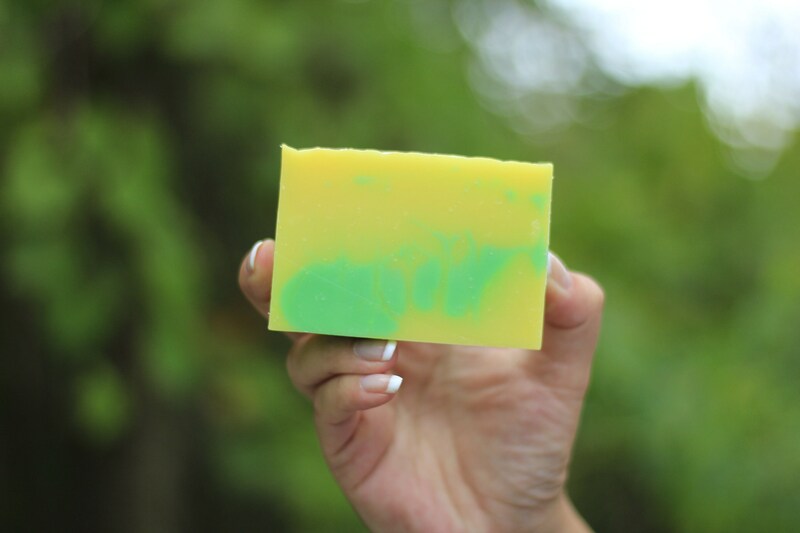 Ingredients: Coconut Oil, Olive Oil, Safflower Oil, Rainwater, Sodium Hydroxide, Lemon Essential Oil, Sage Essential Oil, Mica.